There has been a wave of violence targeting Iranian and Syrian Christians over the past month, say Christian news reports. In addition, Iranian Pastor Youcef Nadarkhani, who has been on death row since 2010 for seeking to register his home-based church, refused to renounce his Christian beliefs in exchange for his release from prison. He was also jailed for questioning the role of Islam as the dominant form of religious instruction in his children’s school. 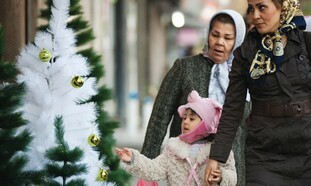 According to a report on the website of the International Christian news agencyBosNewsLife, “Iranian Pastor Youcef Nadarkhani has rejected an offer to be released from prison if he publicly acknowledges Islam’s prophet Mohammed as ‘a messenger sent by God,’ well-informed Christians and rights activists said” earlier this month. While Iran’s opaque judicial system coupled with the lack of access for most Western media makes it difficult to verify the new coercion against Nadarkhani, the reports are considered reasonable in light of the Iranian regime’s intense crackdown on its Christian population over the years. The Post could not independently verify these allegations. Many critics of Assad’s regime, however, view Assad as exploiting sectarian conflicts in Syria to solidify his repressive security apparatus, which has resulted in the killings of over 5,000 pro-democracy supporters in Syria. “Of course Assad is using the power of fear to manipulate the Christians. He is directing these bishops and patriarchs to say what suits him,” Pascal Gollnisch, a Catholic priest and director of l’Oeuvre d’Orient, told the French news organization F24 in December. The Paris-based organization seeks to shield Christians from persecution mainly in the Middle East region and is part of the Archdiocese of Paris. Christians make up 10 percent of Syria’s 22 million population. Clifford D. May, the president of the Washington-based Foundation for Defense of Democracies and a former New York Times reporter, has long argued the persecution of Christians in numerous Muslim-majority countries is the most pressing news story ignored by the mainstream media. Landes added that “it all illustrates Charles Jacobs’ notion of human rights complex – the thing that gets western ‘human rights’ folk indignant has nothing to do with the victims of their sufferings, but the [perpetrators]. If white, hysteria; if of color, embarrassed silence. In addition, Iranian Pastor Youcef Nadarkhani, who has been on death row since 2010 for seeking to register his home-based church, refused to renounce his Christian beliefs in exchange for his release from prison. He was also jailed for questioning the role of Islam as the dominant form of religious instruction in his children’s school. I tend to trust the Guardian one million times more than the “Pakistan post” which seems to be your one and only source for this “article”. What do you know about the ‘Pakistan Christian Post’ that makes it a million times less trustworthy than ‘The Guardian’ ? So what trustworthy information has the Guardian supplied about this situation? And if you read the article carefully, you will find that other sources than the Pakistan Christian Post are cited. Egypt is going down the toilet fast. We are now seeing the true face of Mohammed’s Islam as set out in the Koran; a supremacist and intolerant creed that knows nothing about co-existence and cares even less. The Copts are in for a rough ride, along with every other non-Muslim community in the region. At least the Jews had a country to flee to when they were ethnically cleansed in the 1950’s. I wonder where the Christians will go? Whether the Christian countries of the west and Africa will stand idly by, or whether they will confront the Islamic firestorm that is surely going to engulf their co-religionists remains to be seen. Plight of non-muslims in Pakistan has been diabolical since that country’s creation, to an extent that from over 35% of its population, non-muslims are now less than 5%. Recently four Hindu doctors were murdered and a few weeks previously two Sikh lads were beheaded. These killings, institutional harassment, discrimination and forced conversion can only continue to this extent for this long if they were sanctioned by the state. And the strangest thing is that there was not a peep from the people, press or the government of India. Same story is repeated across the border in Bangladesh and elsewhere in the south east and particularly in Indonesia where Christians and other non-muslims are routinely harassed, discriminated, prevented from worshiping and many killed. There is silent genocide going on across the globe in all muslim countries and the media, people and governments have fallen silent. Such is the hold of fear on our subconscious regarding islam and its genocidal precepts that we dare not say anything. Fear is the key. In democracy violence always, always wins. Apartheid Pakistan – refuge of Osama Bin Laden..
Ziontruth, nowadays there are more Israeli Jews moving to Europe or the USA than European or American Jews moving to Israel. Will you tell us that they feel safer outside Israel? They may be unaware of the situation in Europe, and the United States is still factually a safe place for the time being. Whatever the case, those Jews have decided to buy some temporary safety with the price of moving to lands that are not theirs to defend. The whole world is moving toward serious turmoil, what with the coming economic implosion of the U.S.A. and Europe’s added ingredient of multicultural strife. Those Jews who have moved will find their new residences no safer than Israel, and even worse in being foreign lands, unlike Israel, which is the one and only land a Jew can truly consider the homeland to fight for. Oh good, a principled stand against the level of Holocaust education in public school. I can tell Landes and Jacobs did not think through their line of argumentation on this one. The use of the Holocaust to “prove” the eternal guilt of people of a certain color instead of warning against the dangers of imperialism (Nazism then, Marxism and Islam now*) should be opposed on principle by anyone who would honor its victims. Only in the sense that they left the rationale unexpressed. It is my hope that my above passage fills the missing material. *Islam also has a historical record of genocide with at least 90 million Hindus murdered. The history of genocide of Hindus, the destruction of Hindu temples prove the lie to the claim that existence of Israel is the cause of terrorism. Akbar point, TGIAI! Shavua Tov.